Most of us have probably been stuck at a location because our car battery has died. Large rechargeable jump starters were often seen as cumbersome and unappealing. Jumper cables don't help if another vehicle is not around. 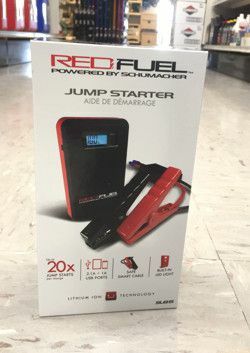 The new, RedFuel Jump Starter from the trusted brand of Schumacher offers the convenience that we expect from a jump starter, in a new powerhouse small, lithium ion powered battery pack. When fully charged, you can obtain up to 20 jump starts per charge. Included with this battery pack are (-) and (+) jumper cables that are petite enough to fit inside your glove compartment. If you need an emergency flashlight or USB ports for your electric devices, this battery pack can help you there as well. For less than $100 this is a great convenience device to have in your car for those times that you just want to get on your way to work or back home again.